Don’t forget to check out Part 1. Our death by food tour continues. After cheesecake at Juniors we countered the sugar rush and subsequent crash with a matinee on Broadway. For dinner it was time to try out some authentic Italian. We ended up on Mulberry St. in the heart of Little Italy. You could dine on the smell of garlic and tomato sauce throughout the place. We didn’t have a specific destination in mind but the menu at Pellegrino’s caught our eye. Dining outdoors with perfect weather. 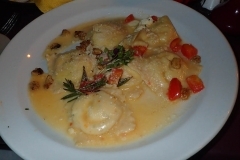 Lisa had the ravioli and I went with the veal. The service was top notch even on a holiday weekend. Following that was some ice cream at Ferrara Bakery and then it was back to the hotel. There we found a treat that had been waiting for us for a while. The hotel had delivered a complimentary bottle of champagne and chocolate covered strawberries. Unfortunately the ice was a bit melted and the chocolate a bit soft. It didn’t seem to stop us though because we finished both of them off before heading to bed. The next morning we decided to try another bagel place. Zuckers Bagels & Smoked Fish. While the place was nice and fit well with the upscale style of Tribeca the bagels were bland and rubbery even with getting them toasted. Live and learn I guess. It was on the way to the metro but it was a let down. We found a decent burger at Bill’s Bar and Burger near Radio City Music Hall for lunch. Dinner was probably the highlight of the food portion of our trip. It included pre-dinner drinks with our friends Teresa and Darrell from back in DC. 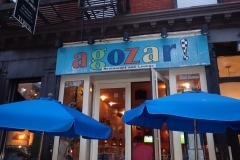 We stopped into Agozar, a nice cuban restaurant on bleecker and bowery. After some drinks and catching up we were off to Peter Lugers steakhouse. I’ve seen them on TV before on the various top steakhouses in America. I’ve rarely had true prime steaks and up until this point the top steaks I have had were wet aged. 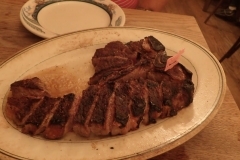 Peter Luger, located just across the Williamsburg Bridge in Brooklyn, serves 30 day dry aged Porterhouse steaks that are aged in the basement of their restaurant. Besides the steak it was the history that intrigued me about this restaurant. Founded in 1887 as Carl Luger’s Cafe, Billiards and Bowling Alley” it was an instant hit with the predominantly German population of the Williamsburg neighborhood. In 1903 it became even more popular as manhattan businessmen started frequenting the restaurant due to the opening of the Williamsburg Bridge. The best part of the story is how it came to be owned by the Formans. Sol Forman established a manufacturing business across the street from Peter Lugers and was known to take clientele across the street to close the deal with a steak. He was known to eat 2 steaks a day and even more when trade shows were in town. Following the death of Peter Luger, Sol purchased the restaurant at auction for the cost of the real estate. 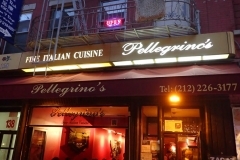 It has earned a Michelin Star and has been rated top steakhouse in New York for 28 years. Some of the things I found interesting is that up until recently they only took cash and their house account Peter Luger Card. They now allow debit cards but no credit cards. They also still do reservations on a book. We booked out three months ahead of time and we able to get either a 9:30pm or 4:30pm reservation. Because we aren’t 80 we took the 9:30 one. While we came for the steak I have to say they impress on the appetizers as well. Or rather the appetizer. Two slices of what could arguably be called bacon steaks. This along with a salad and a pile of onion rings was a nice start. I did find it funny though that when I asked for ketchup the server made sure it wasn’t for the steak. So on to the main course. We ordered the Porterhouse for 2. It comes out sizzling on the plate and the server slices the steak and serves it not with tongs but oddly with a pair of spoons. All I can say is that I am glad this restaurant isn’t located closer to where I live. 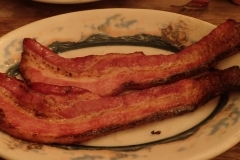 We would go to Peter Luger for all of our special events like birthdays, anniversaries, and Tuesdays. We survived eating New York but I think its only because of the walking. I’m not sure how I would fare if I lived in this city. Lisa informed me that we walked a total of 26.4 miles during the three days we were in New York but I think the food still won. New York is definitely a place I would like to visit again.